Dr. Zoumalan is an expert in straightening the crooked nose. 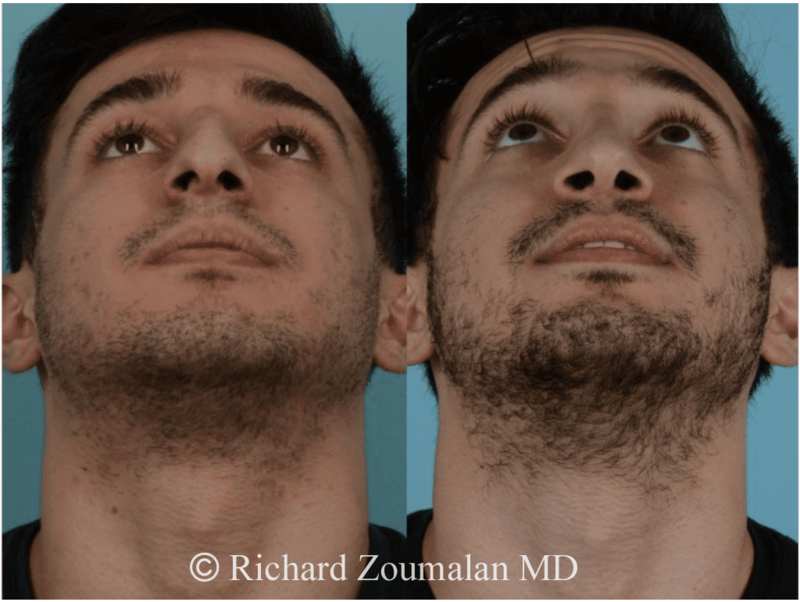 He wrote the chapter on “Management of the Crooked Nose” in the most recent Bailey’s Head and Neck Surgery textbook, which is the most respected textbook amongst surgeons internationally. 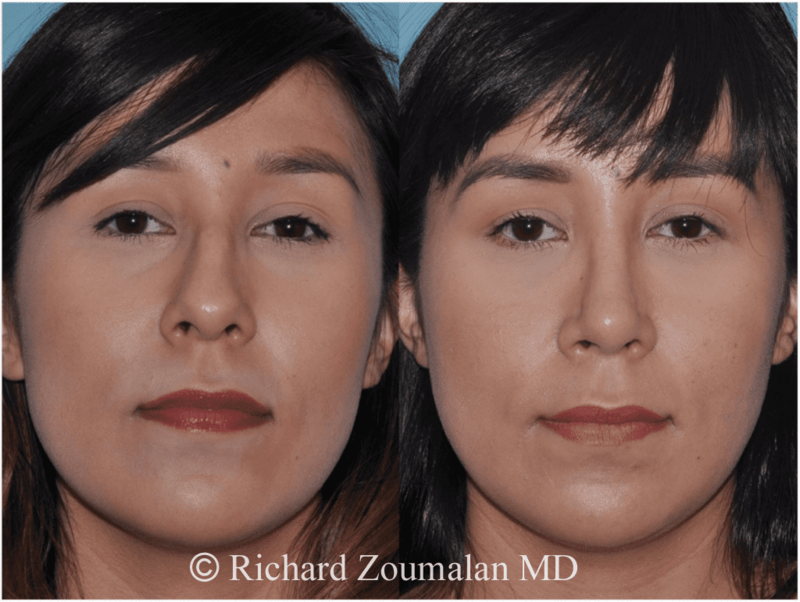 Repairing a crooked nose is a complex procedure that requires understanding of the airway. The crooked nose is usually the result of a crooked septum and nasal bones. In addition to causing cosmetic deformity, this often also causes breathing problems, which can affect exercise, sleep, and sinus problems. Dr. Zoumalan has done extensive research in this field. 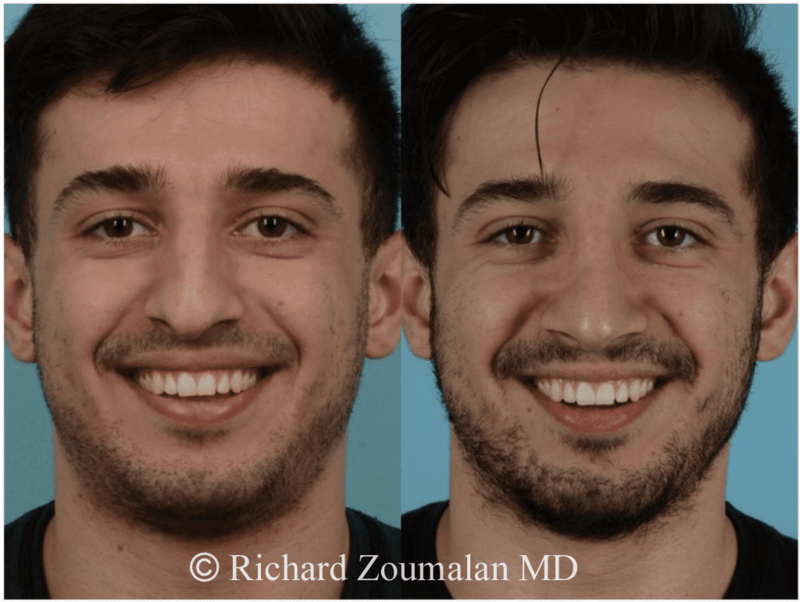 You can see the improvement of appearance in these patients who underwent Rhinoplasty and Septoplasty to improve their crooked nose. 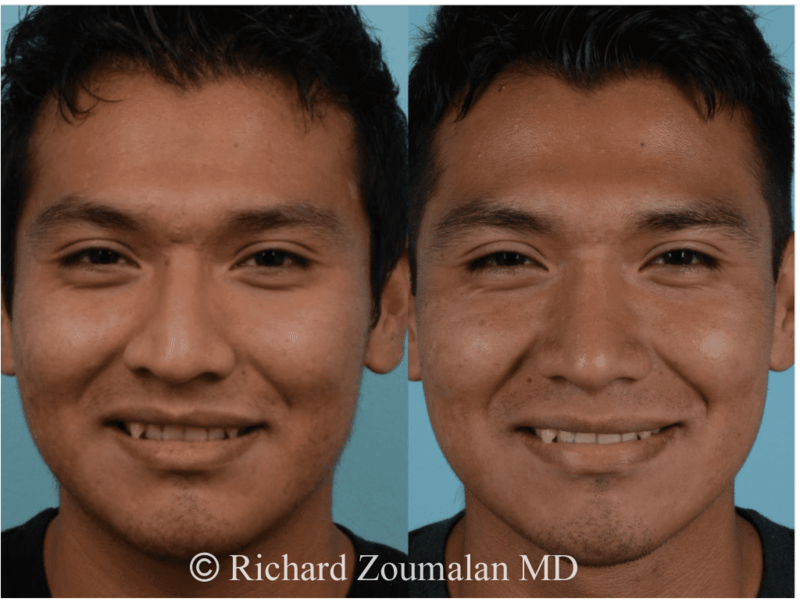 Both of these patients also experienced improvement in their breathing. 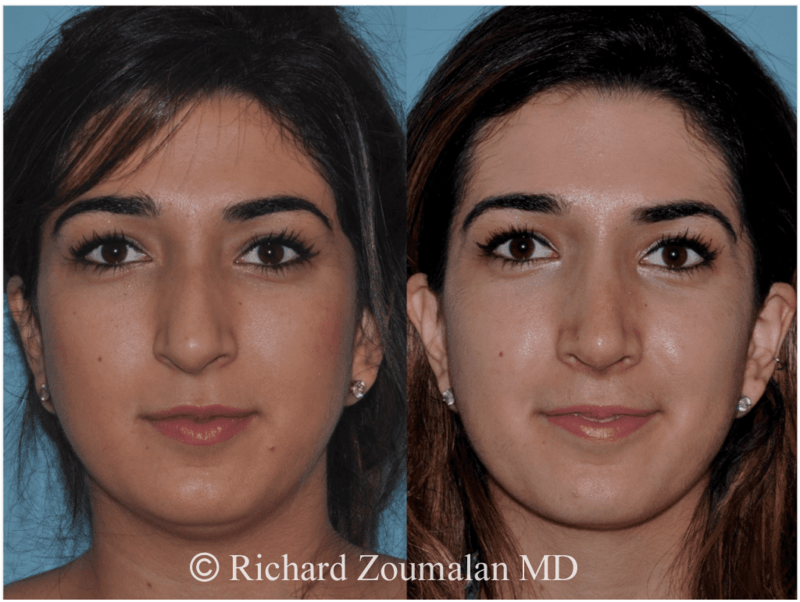 This young woman underwent Rhinoplasty by Dr. Zoumalan. 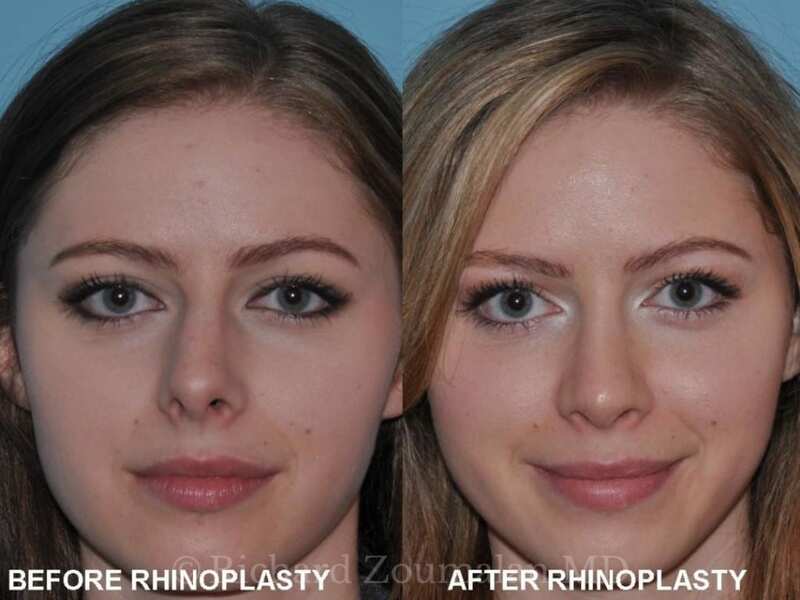 You can see the change in her crooked nose before and after surgery. 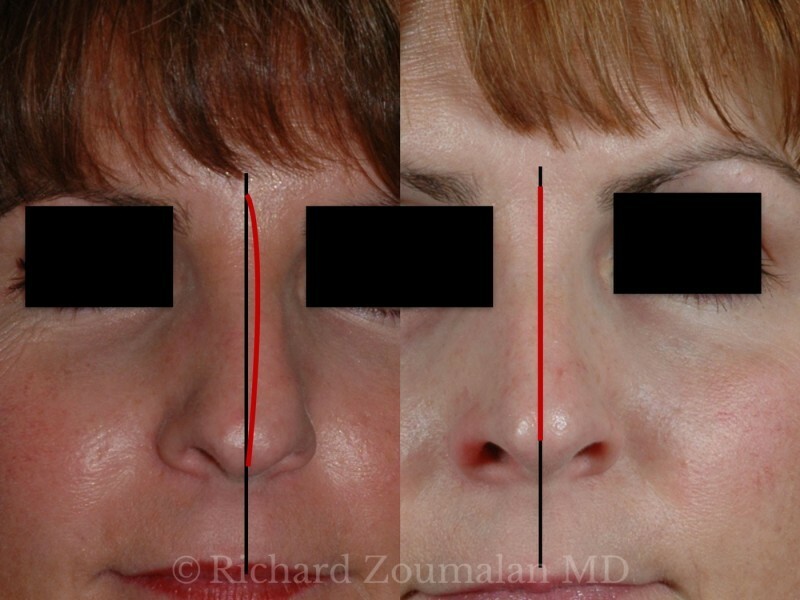 The red line shows the direction of her nose compared to the black line that is her midline of her face. You can see the improvement she experienced. When we say that the cartilage has “memory,” this means that the cartilage likes to go back to where it was before. Dr. Zoumalan uses every technique possible to ensure that the cartilage remains in its new and straight position. However, cartilage can warp (bend) on its own over time. 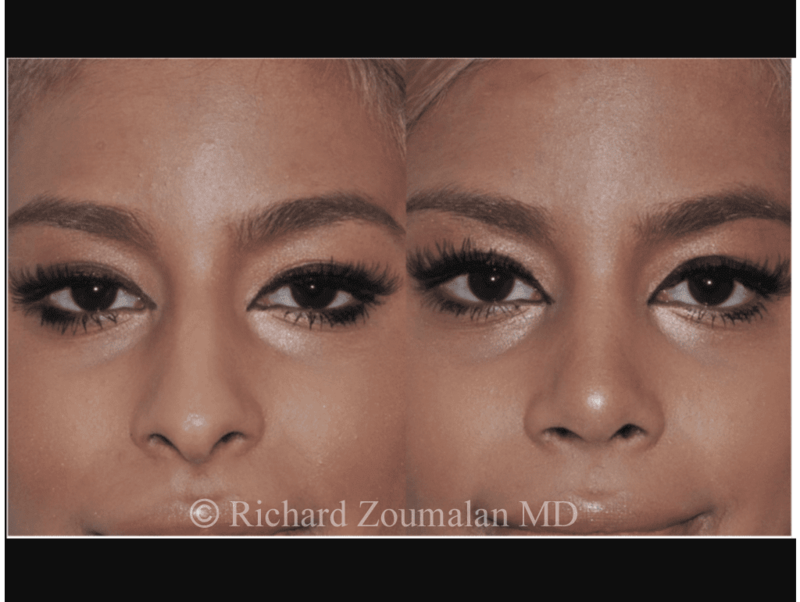 Techniques that Dr. Zoumalan uses to minimize the amount of change after surgery include: spreader grafts, strut grafts, PDS foil, and even extracorporeal Septoplasty, which involves removing the crooked portion of the septum and reconstructing it altogether. This is an advanced technique that few surgeons in the world can do. There are many variations of a crooked nose. The nose is cosmetically and functionally broken up into thirds. The top third, middle third, and lower third. 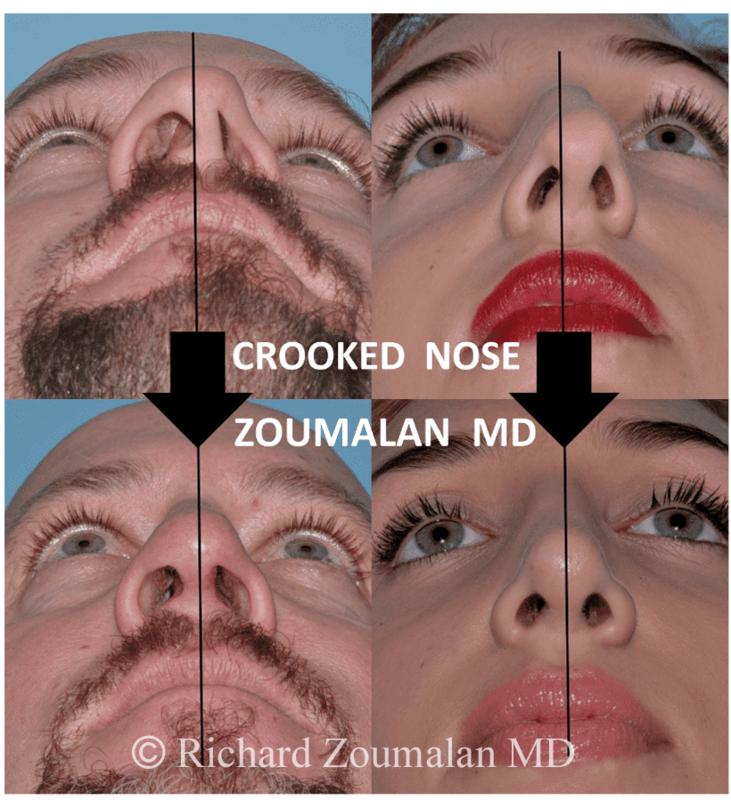 Dr. Zoumalan uses this “Principle of Thirds” to decide how to manage a crooked nose. The figure below illustrates the different permutations of a crooked nose. Artist-rendered images of five different permutations of crooked noses. C stands for Center. R stands for Right of midline. L stands for Left of midline. Thus there are 26 variations of a crooked nose. The 27th variation is C-C-C which is a straight nose. This illustration shows just some of them. 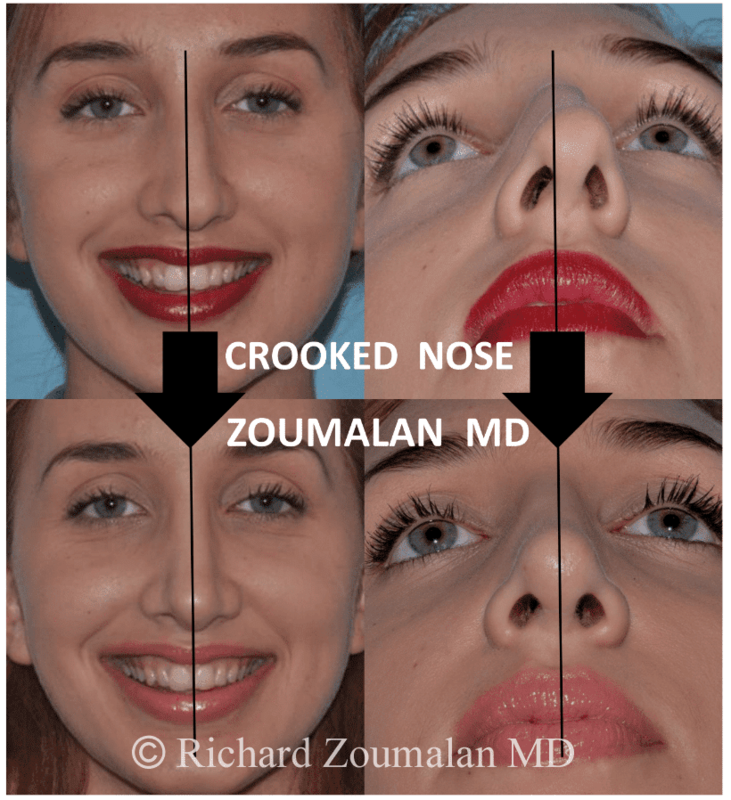 Dr. Zoumalan is familiar and has experience with all the different variations of the crooked nose. To straighten the bony aspect of the nose, osteotomies are performed to align bones properly. Here are some of variations of osteotomies that Dr. Zoumalan uses. 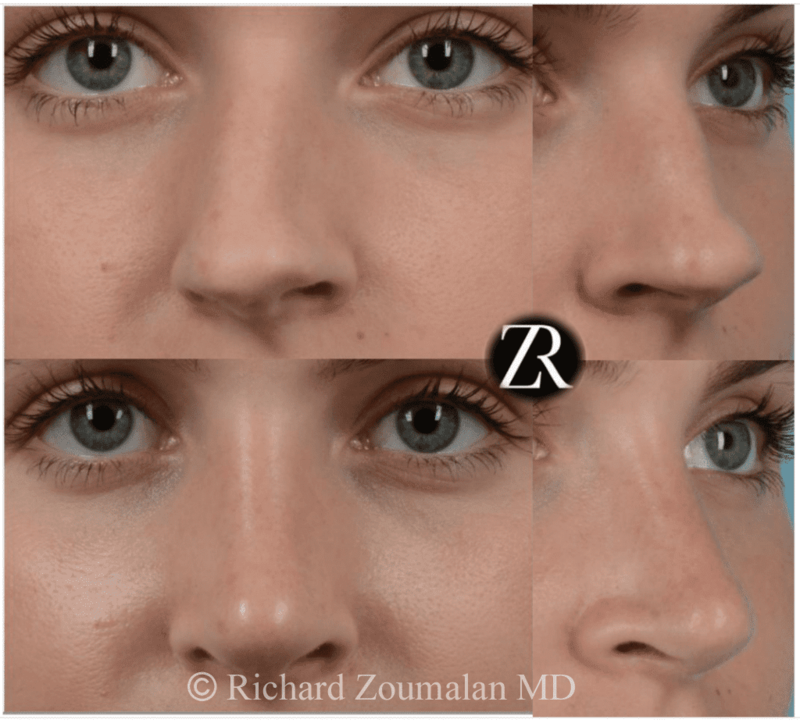 The treatment of a crooked nose remains one of the most challenging aspects of rhinoplasty surgery. 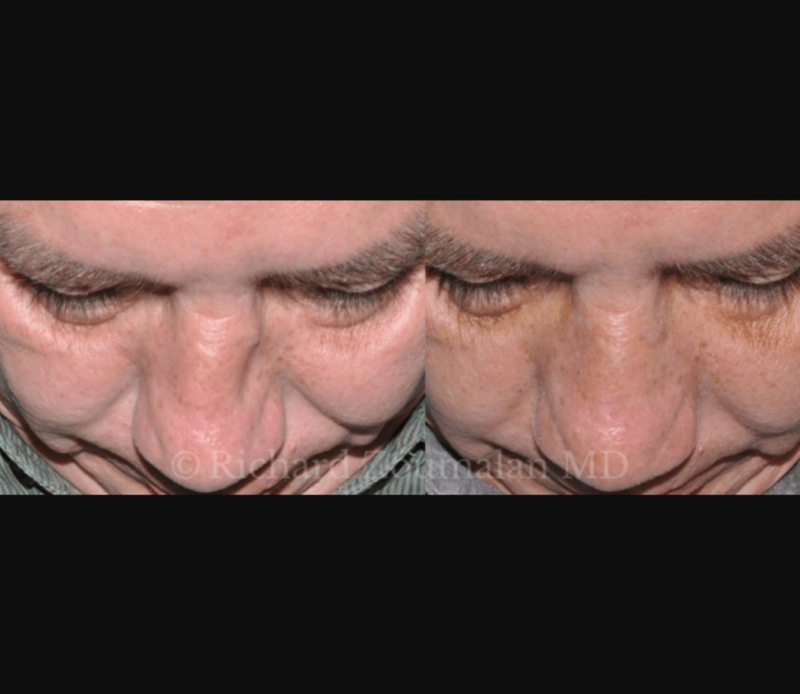 There are many techniques currently available for correction of the crooked nasal deformity. Patients differ in their goals for surgery, and it is essential that the surgeon understand their needs. While some patients are focused on the aesthetic outcome, others are more concerned with functional improvement. More commonly, patients have a combination of cosmetic and functional concerns. The crooked nose can be due to congenital (from birth), traumatic (from an accident), or iatrogenic (due to previous surgery) reasons. 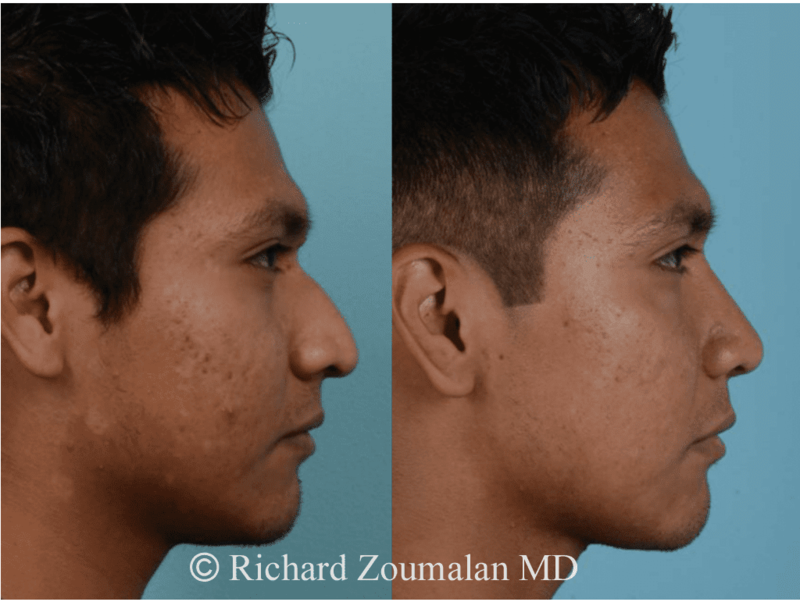 A congenitally crooked nose is often associated with overall facial asymmetry. 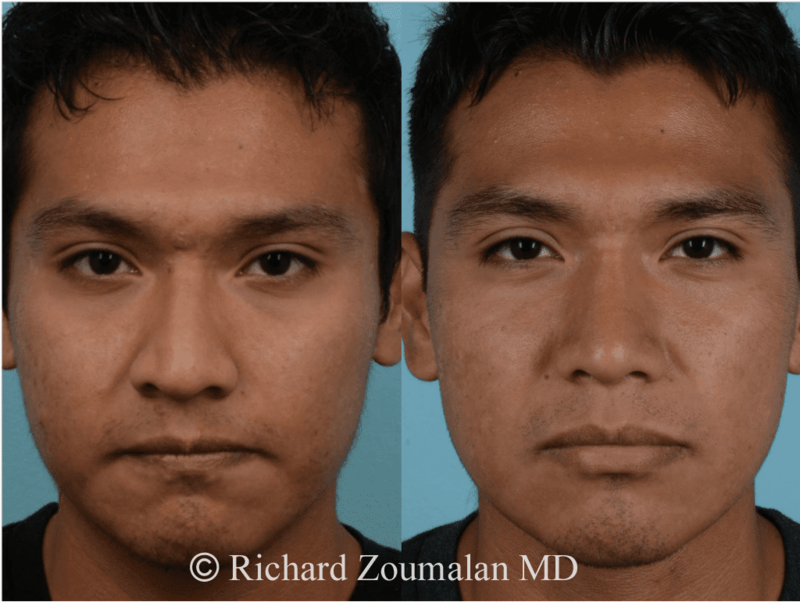 Most patients have mild facial asymmetry. 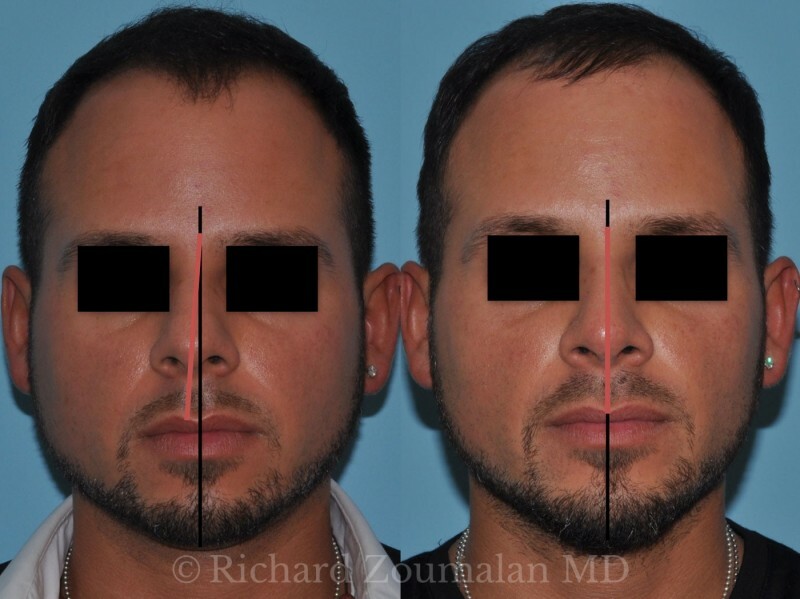 The patient should be informed about these facial asymmetries preoperatively and made aware of how this may or may not affect their outcome. 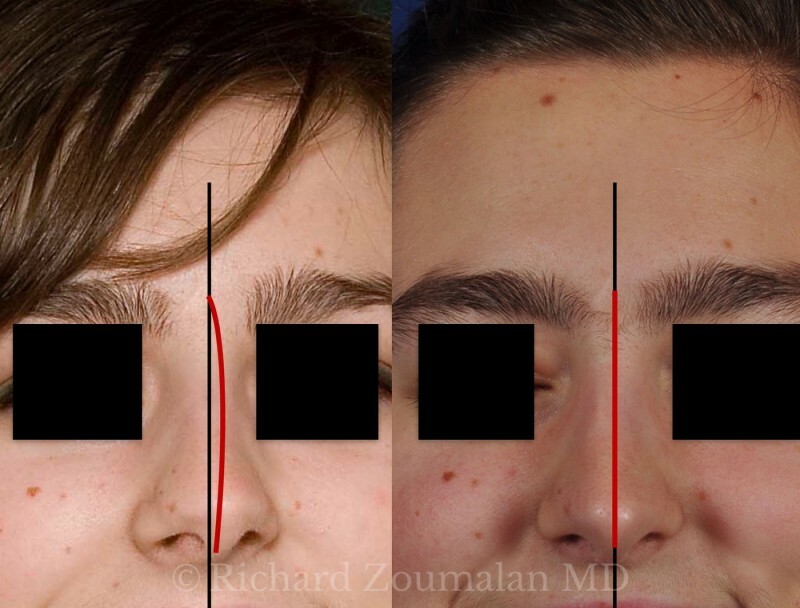 Treatment of the congenitally crooked nose can be challenging since the surrounding deviation of the internal and external facial framework makes it difficult to find a common midline. 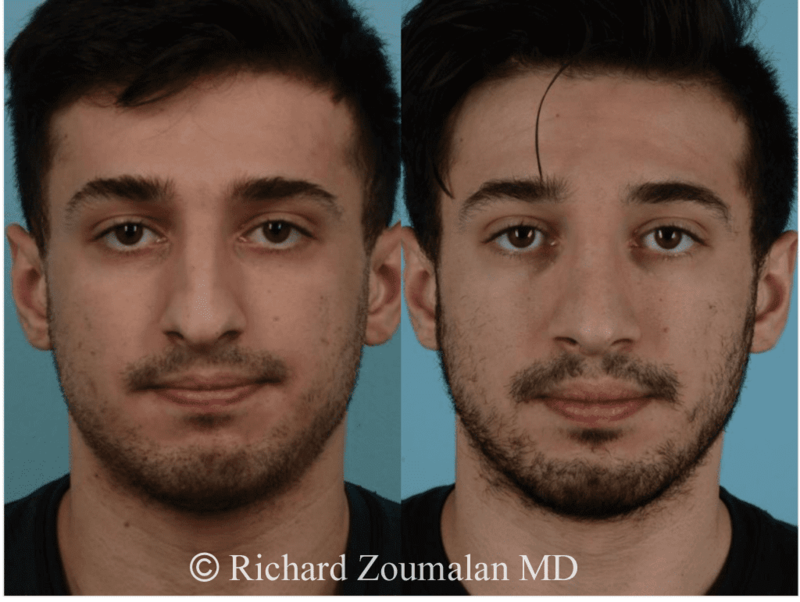 Traumatic crooked noses can be the result of a low velocity force or a higher velocity force that causes nasal deviations on both sides along with deviation of the septum. During your consultation, Dr. Zoumalan will perform a thorough history and physical examination. 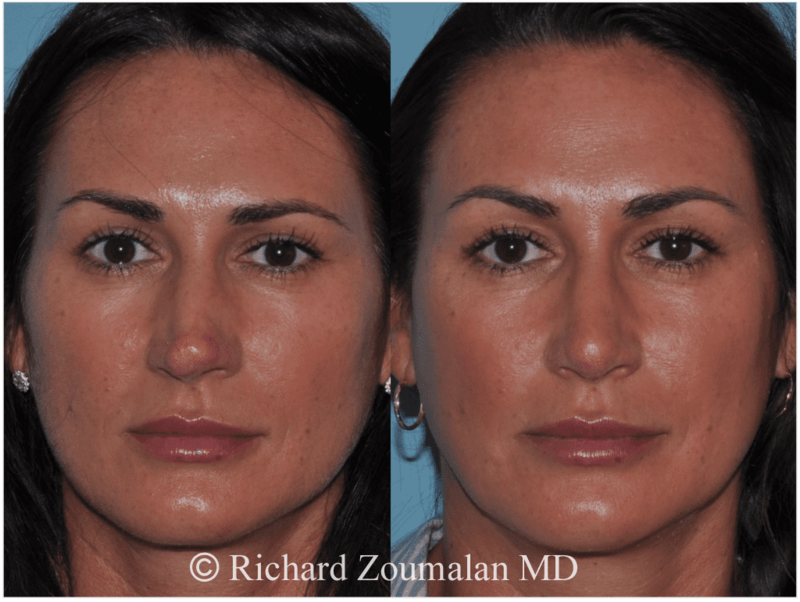 It is important to determine the reason for the deviation in order to reach the best plan for obtaining a nose that is straight as possible.